It’s really worth the effort to consider (at least) these five points before making your final decision. In no particular order….. Think of ALL the vested parties in this decision. You may have multiple content contributors within your own company. See this from their angle. Consider the contribution from your localisation vendor and make sure that their particular role is catered for in the new technology. Perhaps most importantly, consider the translators who will use the software; in particular make sure that their productivity isn’t reduced to the point where their participation might be in question. Make absolutely sure that the tool can produce a Translation Memory that is independent of the system you are buying. You should insist on portability of your translations if this doesn’t work out. Also find out if the translations that you commission through the software are yours or if they will be available in the cloud for other companies to buy. This may not pose an issue for you, but you should be aware of exactly who might benefit from your translated content. 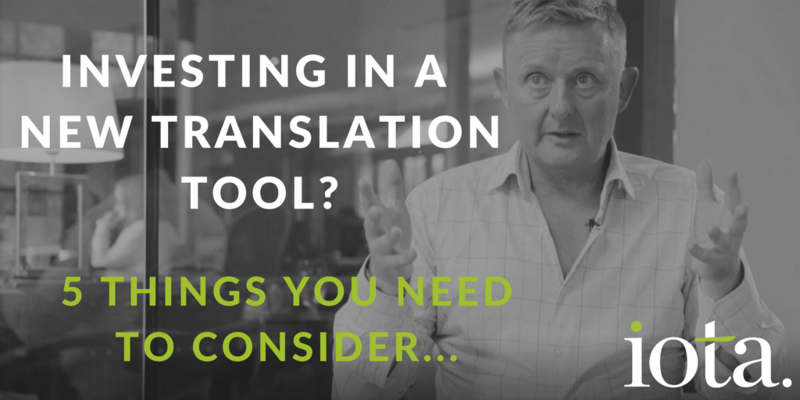 Don’t allow a translation tool be a lead into using a particular translation vendor. The decision about what tool you use and the decision about who you choose to use that tool should be independent. If they end up being the same company, fine, as long as one decision doesn’t automatically influence the other. Try to employ a system that you can rent rather than buy. Large initial investments for set up and calibration means you are immediately vested in a longer term commitment to a tool. Your boss WILL want to see value for money and probably won’t entertain a change of mind if the system doesn’t work out. Decide what metrics or analytics are important to you and make sure your system will deliver them to you. Some customers like to be aware of exactly who many words are being translated and exactly what progress is being made across each of the required languages. This data should be readily available and highly visual to you if required. Seek out advice. Search for at least one content provider, one localisation vendor and one translator who have worked on the tool and who have not been provided as a reference by the tool provider. The internet is full of the feedback you need to make the right decision. Or talk to us. We’ll help you get on the right track, free of charge and without obligation.